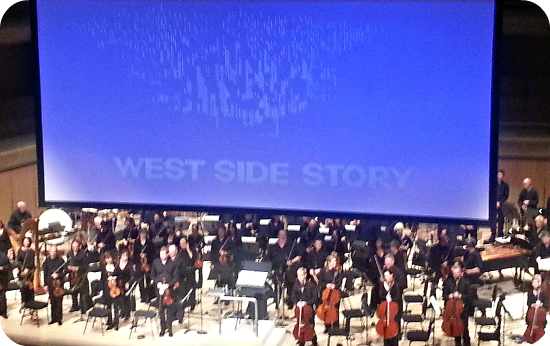 Last week I had the extreme pleasure of attending a screening of West Side Story at Roy Thomson Hall, where the TSO was playing the soundtrack live in sync with a hi-def remastered version of the film, original vocals and dialogue intact. I was absolutely obsessed with West Side Story and wanted to be Natalie Wood (minus the horrible dying via your worst fear part) when I was in high school. It ignited my obsession with NYC and big cities early into my teen years, so it’s no surprise that this was a memorable night for me. I have attended the TSO once before, but it didn’t captivate me in the same way this performance did. At a normal TSO night everything is very quiet, the definition of a “grown up” show (aka a situation that makes my brain likely to tune out because I’m not a huge classical music fan, and I feel slightly uncomfortable in musical situations that forbid interaction and participation). This time around there was popcorn and we were allowed to bring booze into the Hall, which immediately made it more relaxed. There were still a few TSO regulars in the audience who were horrified by the crumpling of popcorn bags and general feelgoodery and fun of the night, but they weren’t able to rain on anyone’s parade. The charm of watching the Symphony play along with a film you love, is that you get to actively experience the true magic and brilliance of the music, and witness just how much work goes into creating a truly powerful soundtrack. This goes even moreso for a musical like West Side Story – which relies so heavily on Leonard Bernstein’s incredible score. It was fascinating to watch this massive collection of musicians come in perfectly, right at the exact moment they all needed to, so that it matched up with Maria and Tony’s vocals. Normally I am one of those clueless fools who doesn’t really understand the true power and necessity of a great conductor, but this show completely changed that for me. It is 100 percent on the conductor to make sure the entire orchestra is coming in at the exact time they need to, or everything is thrown off and you have a horrified audience. That kind of pressure seems unbearably overwhelming, but Steven Reineke did a flawless job. I noticed he had a screen in front of him playing a special version of the film that had blocked colour bars scrolling across, which must have helped with the timing. I am still curious about what each colour meant! The performance ended with a huge, much deserved standing ovation, and the audience clapped for each person listed in the credits as though it were TIFF, which always fills me with joy. Overall, this show turned on a light bulb for me when thinking about classical music. I highly suggest that, even if you’re not particularly a Symphony kind of person, if you ever get a chance to see a film with a full orchestra playing the score live, you jump on it. This is exactly how the TSO can bring in a newer, younger audience. It was a perfect evening. I am praying they will continue this series and play live to Singin’ In The Rain, Breakfast At Tiffany’s or Taxi Driver (highly unlikely, but it is my most favourite score and film) next.